Sharing Woodturning and Woodworking experiences & skills. ..........I managed to salvage it. I have this shed full of wood that has been drying for +10 years, all harvested here in Utah. Last week I visited the wood shed and found a piece of spalted maple that had stunning patterns. That was the good news, the bad was that this wood was badly punked. It turned like powder. Determined to salvage this wood I decided to ignore the voids the powdered wood left while turning and just get it shaped and coated. The blank could not be mounted by its punky bottom (I tried) so I glued a hunk of plywood to the bottom and turned it. I later removed the plywood. I brushed untold amounts of sanding sealer and finish on the rotating peice until I got the wood stabilized. Not the fine finish I am used to but I did manage to salvage a beautiful hunk of wood. As Greg, my wood-turning sensei used to say to me "let the wood speak to you" ...... it did! I can always tell if I did good when my wife (who owns lots of round things) comes into the shop and says; "That bowl isn't going anywhere". It likely that you will not be able to chuck the bowl with a turned foot. You can glue a block on the bottom to use as the foot and then turn it off later. This is the first time I tries this and it worked well. You can brush on copious amounts of finish while rotating slowly on the lathe. This stabilizes the wood. I glued on a plywood foot for turning. Then it was turned off using the vacuum chuck. Coating the surface with finish to stabilize the wood. 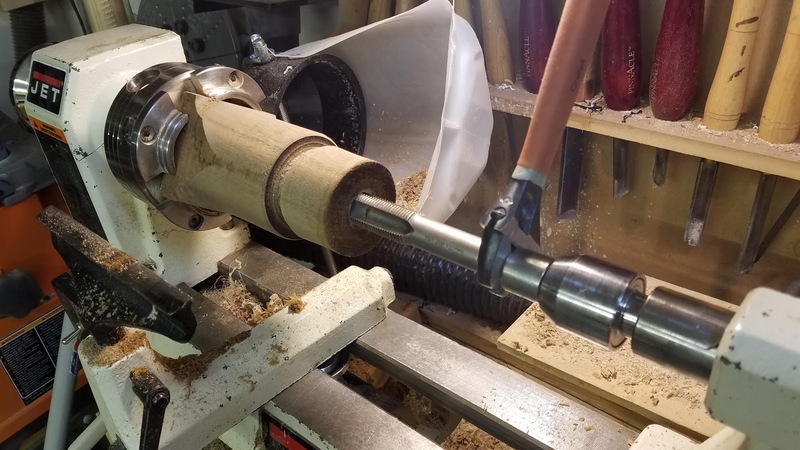 Turning the bottom with a high angle grind on the tool. If this post helped you solve a problem, saved you time or was otherwise useful consider donating. Use the link in the upper right of the site. Donations fund some of the expense of tools and materials for my shop and lab so I can bring you more content like this. Also let me know if there is other content you would like to see me explore! I have been working on and off building a thread cutting jig idea for my lathe to use to make boxes with threaded lids. Recently I got back to it and solved a long standing problem I had with the chuck not turning concentric to its threading shaft. The jig consists of a HF multi-axis vice, a few 3/4-16 nuts and a shaft all mounted on a removable platform on the lathe. I use a 60 degree cutter mounted in the head-stock to cut the threads. The cutter is held in place with a collet and draw-bar. The object to be threaded is mounted in a chuck which is then screwed to the threading shaft. A hand-wheel manually rotates the object as the cutter cuts the threads. Note: an advantage of a jig like this is that you can easily cut threads in common woods. Hand thread cutting is best done with woods that suited for that purpose. Later I will post on operating this jig. 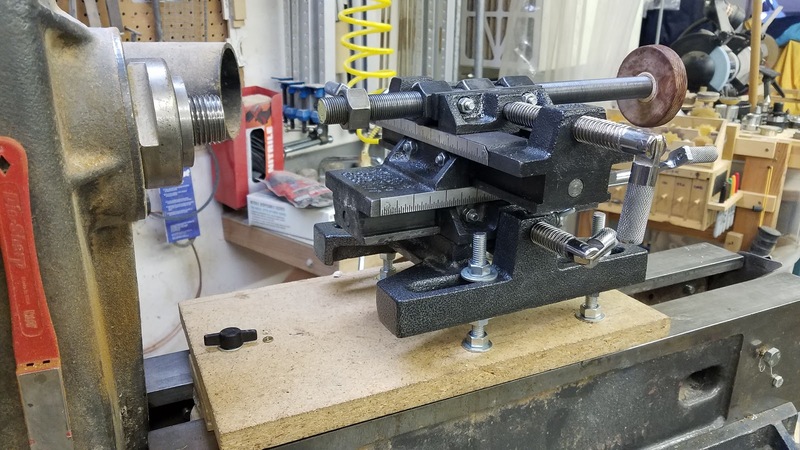 The vice is a 5" milling vise that cost $70 at Harbor Freight. I took it all apart and cleaned and adjusted it. Its not the best cross-slide but if you insure that you lock the axis after each move, it works just fine. Your cross slide does not need as many axis as mine but I did not find the other options to be any cheaper, perhaps it is better quality? If I had to do it over I probably would have gotten the 6" vice with fewer axis. The main part of the jig is a shaft that has the same pitch as the threads you want to cut. This one is 3/4-16 but the bar can be replaced with whatever pitch you want. You have to get an adapter to screw the chuck on the threading shaft. I have only found adapters for 16 tpi and 10 tpi threads to fit 1-8 spindle threads. Any 60 degree double angle cutter should work. I do not know where I got mine, perhaps MSC. Once you have the parts the assembly is straightforward. Make a base that can be clamped to the bed and holds the vice such that the threading shaft puts the chuck on center. Clamp the shaft and three nuts into the cross vices upper jaws. The multiple nuts help reduce backlash. Screw the adapter on the shaft with a backing nut. If your lucky the face of the backing nut will be share enough to get acceptable run-out of the chuck while threading. If not you will need to make your own nut from wood. The problem that caused me to put the jig on the shelf is that the metal backing nut did not insure the chuck seated perpendicular to the threading shaft. So the chuck wobbled and that is not good for threads this fine. 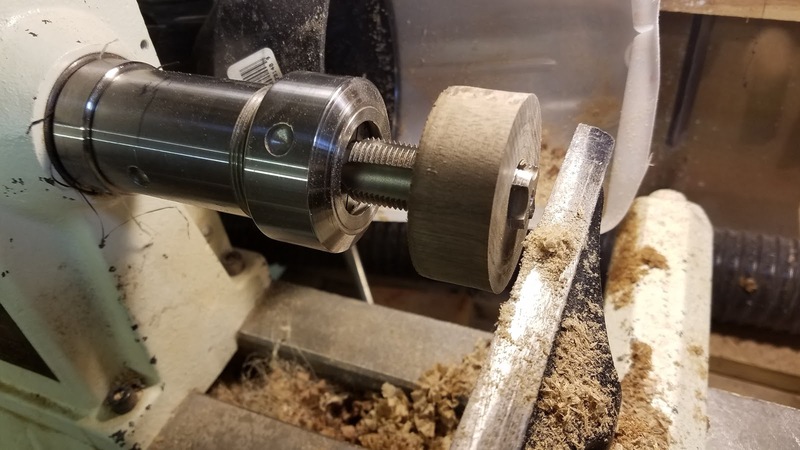 I got a hint from a YouTube Mike Pierce posted and decided to try and make a wood backing nut so that I could get the face of the nut perpendicular with the shaft. Most nut faces are not that precise. To make this nut I drilled a 11/16 hole with a forsner bit in a peice of hardwood and threaded it with a 3/4-16 tap. I held the tap between centers to keep it straight. Use CA on the hole to help stabilize the thread cutting. Then mount the tap into a collet and put it in the head-stock. Screw the wooden nut back onto the tap and with light cuts surface the face of the nut. Now screw the wooden nut onto the threading shaft followed by the adapter. Chuck attached, this backing nut created to much runnout. Holding the wooden backing nut and facing it off. The threads in this box were a bit tight. I put the entire jig and assy back on the lathe wondering if it was repeatable and cut the base's threads deeper. That loosened up the threads, apparently the jig is repeatable :)! 5" milling vise that cost $70 at Harbor Freight. Way back when I was a boy in my dad's shop I learned how to cutout milk cartons to use as storage bins. To this day I use these bins throughout my shop. They are inexpensive, waterproof and the ideal size for storing stuff. Now days milk mostly comes in plastic but I drink orange juice and almond milk which still come in cartons. Get a carton, wash and dry is out and then cut out only the top. This leaves a nice storage bin that even has a handle. 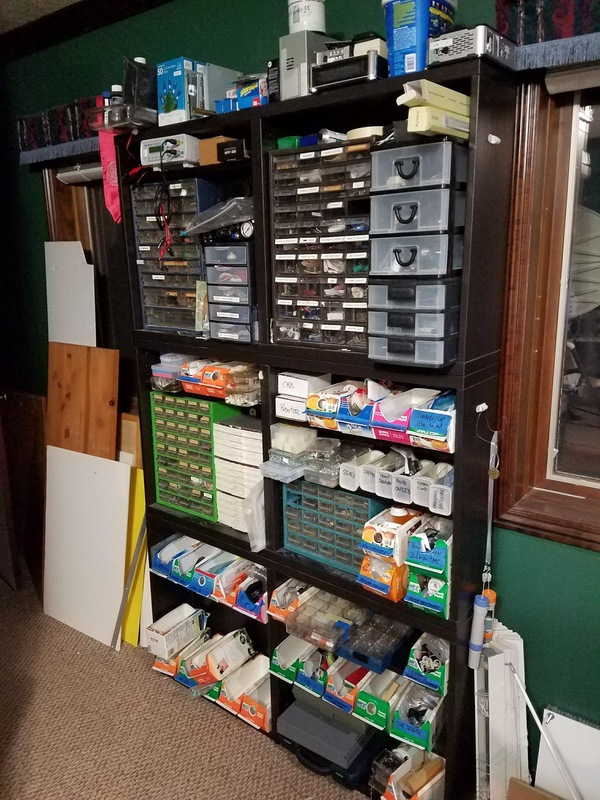 I also use them to keep all the parts of projects I have in process all in one place. Believe me I have way to many projects in process. This is a multi-tier milk carton bin shelf storing a whopping 60 cartons. See video! 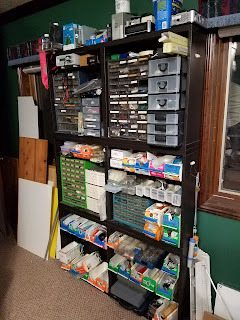 I was keeping small parts like resistors and LED's in these cartons but further sorted into pill bottles which were then kept in the carton. That turned out to be a little less organized than I wanted. I dawned on me that I could make a pill bottle holder the same size as the cartons, making it easier to see the labels on the pill bottles and retrieve the parts. The top is 1/8" and the sides are 1/4 both are fiberboard I got at HD. The sides are glued and clamped to the top after cutting the holes with a Forsner bit. You can lay out whatever pattern suites the type of parts you are storing. In this case they are resistors sorted by the multiplier band. It fits on the shelf next to and in the same space as the other bins. This method would probably work well for surface mount parts also. 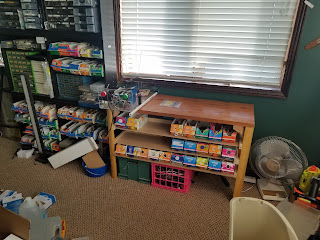 Donations pay for more tools and materials used to create more content for you! The author does not make any warranties about the completeness, reliability and accuracy of this information. Any action you take upon the information on this site is strictly at your own risk, and the author will not be held liable for any losses and damages in connection with the use of this information.